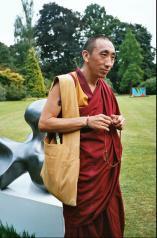 Geshe Gedun is Tibetan Buddhist monk of the same lineage as His Holiness the Dalai Lama. He is based in Rome and has his own virtual website on the internet - just do a search and type in his name. When Pam Evans discovered this fact she commented, "You are our very own Lama in cyberspace! My pupils will love that." 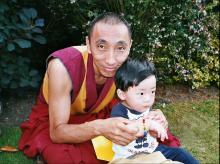 Geshe gave his first Peace Mala to this little Chinese boy. Notice how the beads have been well used and have "stretched" on the mala - he had been using it in the traditional way for meditation and counting mantras! It's wonderful, very beautiful and very special.